With London Met the following week the regatta was used to test out potential combinations before heading to Dorney Lake. The club’s first event of the day was Mens Division 2 8+. This included Mens Club 2 8+ where a new UCD combination raced neck and neck down the course with Neptune, whose time together in the boat showed as they just pipped College for the win by 0.25 seconds. Also in this event was the Mens Novice 8+ with UCD’s crew producing an excellent performance to win their category by 3 lengths over Trinity A.
Mens Division 1 4+ was next where UCD’s Mens Senior 4+ was the only entry in their category so they lined up alongside the other grades. They won their heat and were clear winners in the final, 8 seconds clear of Commercial’s Intermediate 4+. Mens Division 1 4- was a straight Mens Senior 4- final with two Commercial crews and one each from Trinity and UCD. Commercial’s boats were faster off the start and extended their lead throughout the race with a battle developing between the university crews for 3rd. UCD took the advantage in the middle of the course with Trinity pulling ahead entering the last 500m before UCD pulled ahead again towards the end to finish 3rd, 12 seconds behind the winners. 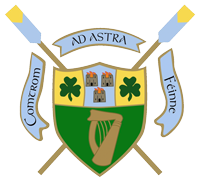 Mens Division 1 8+ saw two matched UCD crews compete at Mens Senior 8+ and Mens Intermediate 8+ with both progressing through their heats to the A final. All crews were battling the conditions in this last race of the day with Commercial’s Seniors winning by 3 lengths over UCD’s Senior entry with another 1 1/2 lengths to UCD’s Intermediate entry. Commercial’s Intermediates were 3/4 lengths back again with Trinity’s Seniors in a similar position before a crab near the end took them out of the race. Full results are available on Rowing Ireland.